Florida man seeks a quarter of a billion dollars that won’t help state. Governor Rick Scott of Florida would like to beat Texas. It’s no wonder why. Since 2009, private industry in the Lone Star State has grown at a compound annual growth rate of 5.2 percent, second only to fracking-rich North Dakota. Over the same time period, Florida’s private industry grew a paltry 1.9 percent on a compound annual basis. Real per capita GDP in Texas is now over $54,000 while real per capita GDP in Florida is less than $39,000. So in order to beat Texas, Governor Scott would like a new $250 million incentive fund to entice firms to relocate to the Sunshine state. This would replace the $43 million incentive program that the state currently operates. And in cases where firms are about to move and are asking for a lot of money — over a $1 million — he’d like to be able to approve the deal with only his signature and those of the speaker of the house and the senate president. The governor’s request makes perfect political sense; it would allow him to dispense privileges to highly visible concentrated interests. But it makes little economic sense. Both theory and data suggest that “targeted incentives” do nothing to improve the economic fortunes of a state and may even be counterproductive. Moreover, there are better ways that Florida might compete with other states. Good Jobs First has been compiling data on targeted economic development subsidies for years. Their data is imperfect due to the fact that states are notoriously opaque about their corporate welfare. But for the moment it is the best available. To test the relationship between corporate subsidies and economic prosperity, I ran a series of simple regressions. 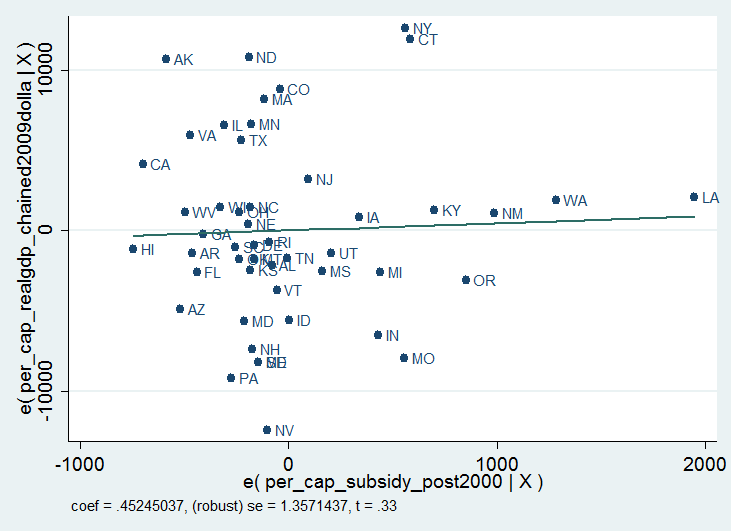 First, I wanted to see whether subsidies seem to have any relationship with state economic growth. They do not. 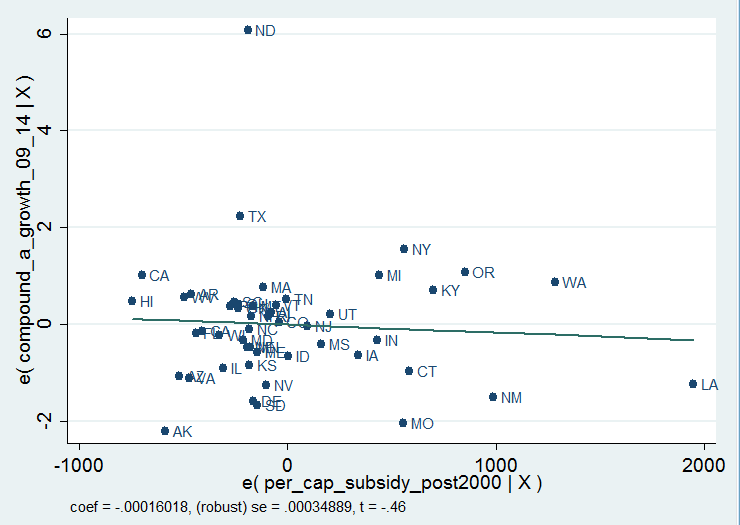 There is no statistically significant relationship between per capita subsidies and compound economic growth from 2009 to 2014 (the relationship is actually slightly negative, suggesting subsidies might hurt growth, but the relationship is statistically insignificant). 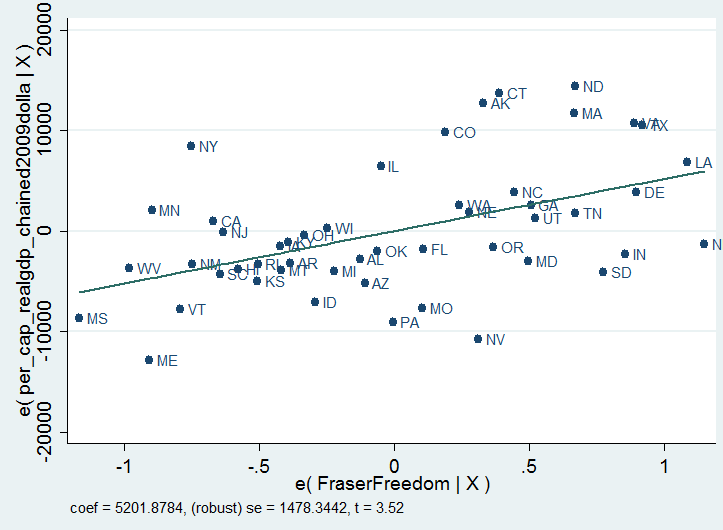 This finding did not change when I introduced controls for different regions of the country and for other policies, as measured by a state’s degree of economic freedom (calculated by the Fraser Institute). It also didn’t matter whether I looked at recent subsides or at all that are available in the Good Jobs First database. These regressions are admittedly simple. But they are consistent with dozens of academic studies. 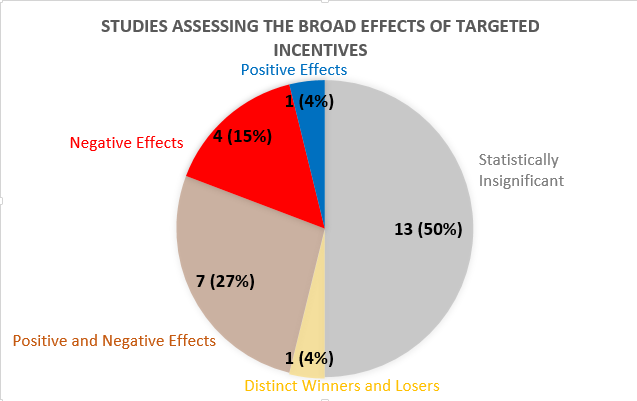 For the past several months, my colleague Olivia Gonzalez and I have been reading through all the peer reviewed academic studies of targeted incentives we could find. So far, we’ve looked at 81. Most of the studies look at the performance of the subsidized firms relative to non-subsidized firms. Unsurprisingly, 65 percent of these studies find that the privileged group tends to fare better than non-privileged groups. If you tax Peter and Paul in order to subsidize Mary it’s not particularly surprising to find that Mary fares better. Some studies, however, ask a more important question: they look at whether the broader economy fares better when Mary’s firm obtains a privilege. Presumably, Governor Scott hopes to make all Floridians more prosperous by privileging a few firms. Among those studies that evaluated this more important question, we found only one that detected a positive effect for the broader economy. Four studies found an unambiguously negative effect for the broader economy, while 13 studies (half of the sample) found no statistically significant effect. Others found both positive and negative effects or distinct winners and losers. A summary of these papers is shown in the pie chart below (the first number indicates the number of studies in that category while the second indicates the percentage of studies in that category). 1. Regional unrealism: For 200 years, economists have known that regions prosper when they specialize according to their comparative advantage. But the best way to determine a region’s comparative advantage is to let market signals do their job. As, Frederic Sautet, Pierre Desrochers, and Gert-Jan Hospers explain, however, subsidies distort these signals and encourage the accumulation of labor and capital in places that are fundamentally unsuited for these activities, a phenomenon they call “regional unrealism.” Maybe Florida is the right place for Northrop Grumman (which has received about half a billion dollars in subsidies from Floridians) to operate. And maybe it’s not. The only way to figure this out is to allow it to respond to genuine market signals of prices, profit and loss. 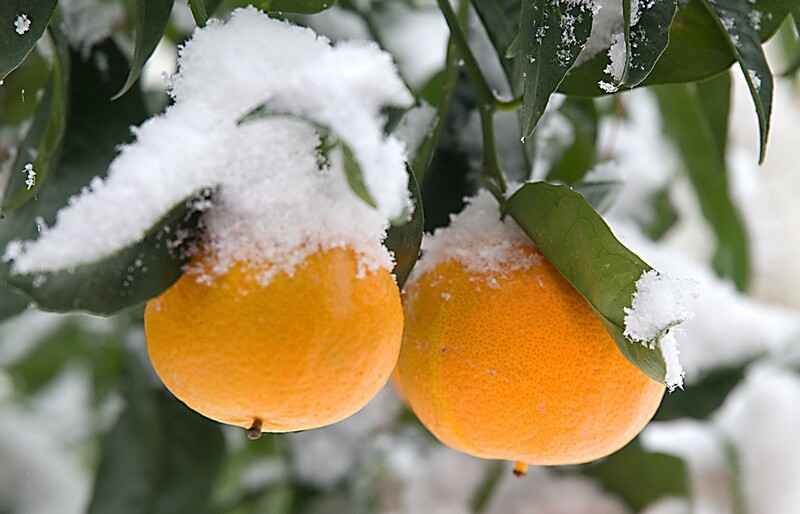 Remember, with enough incentives you can get oranges to grow in Maine. But that doesn’t mean you should. And in fact, Maine would make itself poorer if it tried to specialize in ways that were inconsistent with its comparative advantage. 2. An uncertain effect on movement: Policy makers, the firms they subsidize, and the “site selection” firms that facilitate these deals all have an incentive to claim that subsidies tip the balance and make firms move to a particular place. But there are a host of reason why a firm might choose a particular location (its workforce; its consumer base; its climate; its proximity to natural resources, suppliers, supply routes, etc.) and there is little credible evidence that subsidies are a significant factor. 3. Flighty firms: Even if it is true that Northrup wouldn’t have located there but for the subsidy, that in itself is a problem. That’s because firms that locate in a state because it has offered them a subsidy are inherently flighty firms. What is going to keep them from either pulling up stakes next year, or — perhaps more likely — threatening to pull up stakes next year if they don’t get a better deal? This isn’t idle speculation, firms do this ALL THE TIME (think: Boeing in Washington). 4. Un-diversified portfolio: The political process tends to favor “glamor” industries: film, green energy, high tech. But a well-diversified economy will have both glamorous and more pedestrian industries. To the extent that they subsidize a homogenous set of firms, states like Florida are making their economies less diversified, and therefore less resilient to sectoral shocks. 5. Rent seeking costs: Firms expend real resources seeking privilege. They lobby, they donate to PACs, they employ pricey site location experts and they agree to do things that are dumb for business, like hire X number of employees and invest Y amount in plant equipment, in order to satisfy policy makers. (Note: policy makers consider such requirements a feature of targeted incentives; they are a bug. If the benefits of hiring X number of employees exceeded the costs, firms would do it of their own volition). All of these activities are known to economists as rent-seeking costs and they can be extraordinarily wasteful. 6. Misallocation of talent: When policy makers dole out privileges, entrepreneurs who might otherwise be thinking of new ways to create value instead spend their time thinking of new ways to obtain privilege. Economists call this “unproductive entrepreneurship” and it creates a very serious long term loss in dynamism. 8. Crowd out of other businesses: Two hundred and fifty million dollars does not grow on trees. The state will have to either raise taxes or reduce spending in other areas in order to generate this revenue. Taxes, of course, impose deadweight losses which means that non-privileged firms and their consumers will pay an economic price for the privileges of the few. 9. Hayekian knowledge problem: If Rick Scott-the-personal-investor chooses to invest his own savings in Northrup Grumman or in Searchlight Capital or in Hertz, he has every incentive to carefully weigh the costs and benefits of his decision. Helpfully, he will be guided by the signals of prices, profit, and loss. But when Rick Scott-the-governor chooses to use other people’s resources to subsidize particular firms, he has little incentive to carefully weigh the costs and benefits. Sure, he will want to make sure that he can point to “jobs created” and to “capital invested” but those are the costs of the subsidy, not the returns. Since he will have no personal stake in the investment, he has much less incentive to ensure that these costs generate any sort of positive return over the long run. What’s more, as the economic Nobel Prize winner F.A. Hayek noted in his seminal piece on economic knowledge, Governor Scott is essentially flying blind. He is not buying stock in the companies he is subsidizing, so he is not guided by the signal of share price. And the resources he is drawing on are as good as “free” to him so he is not guided by the signal of opportunity cost. As my colleagues Christopher Coyne and Lotta Moberg explain, his decision, in short, is liable to be systematically biased against good investments. Due to a history of in-migration, real property rights and land-use regulation have been hot-button issues. On the one hand, local zoning laws are fairly restrictive, but on the other, compensation is required for certain regulatory takings, and the state has adopted the nation’s furthest-reaching reform of eminent domain. Labor law is generally pro-market, apart from a minimum wage, but independent occupations face a thicket of licensure requirements. Non-physician medical professions are treated more harshly here than almost anywhere else: nurse practitioners are not allowed to practice independently, the state is not a member of the Nurse Licensure Compact, and physician assistants are not allowed to prescribe medication. In 2011, after the closing date for this edition of the freedom index, Florida did liberalize restrictions on dental hygienists. Data from the Council on Affordable Health Insurance show a big decline in health insurance mandate cost between 2009 and 2011. The state has deregulated cable and telecom markets. Florida created a state-run homeowners’ insurance corporation in 2002 (rather than deregulating premiums), which subsidizes costly coastal homes at the expense of inland taxpayers and has destroyed the private property insurance market in several areas. Governor Charlie Crist vetoed a reform bill in 2010. Matthew Mitchell is a @mercatus economist, adoring husband of @MeganMitchell and proud dad of (off line) Maggie and Libby. Opinions are his own (if even).